It's all fine and dandy to grandly name your restaurant Paradise Indian Cuisine. But if your food turns out to be mediocre, you end up looking silly. The sole consolation of our recent meal at Paradise (1660 Whitehead Court in Gwynn Oak, MD) was that only a few items were obscenely bad. When an Indian restaurant shovels cold Chutneys to diners it's a bad sign. At Paradise, both the Coconut and Mint/Green Chutneys were cold. Worse, Coconut Chutney was a tasteless abomination. There was no evidence any green chilies went into its preparation. Thank God, the Mint Chutney was at least flavorful. To make up for the tasteless, chili-less Coconut Chutney, Paradise's chefs poured a ton of chilies in the Upma turning it into a spicy disaster. Paradise's Vegetable Biryani was an impostor. Far too dry, the Vegetable Biryani consisted mostly of onions. Also, the masala paste was not properly mixed into the rice resulting in clumps. Most vegetarian items had one problem or the other. Sambar was low on tamarind and high on spices and black pepper. 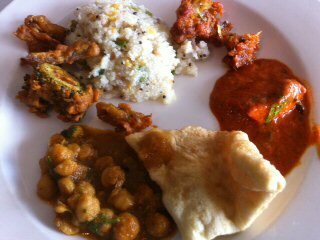 Channa Masala in a watery sauce was flavorless. Palak Paneer had a raw taste. The two bread items we tried, Batura and Naan were rubbery and utter travesties. Gobi Manchurian was slightly sour and crisper than it ought to be but, mercifully, still palatable. Tandoori Chicken was badly marinated, too dry and plain awful. The sour gravy for the Butter Chicken didn't curry favor with us. Fish Curry was easily the worst non-vegetarian item. Not in the least spicy, it had way too much turmeric powder. Chicken Biryani was the best of the lot with a nice aroma and a decent taste. Desserts at Paradise were a mixed bag. The medium thick Semiya Payasam was hot and flavorful. 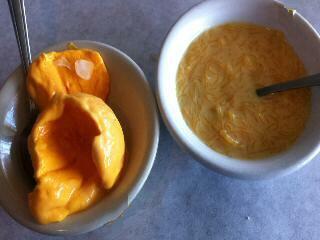 But the Mango Flan (ice-cream) was disappointing and had a slightly chemical taste. As we walked into Paradise, the waiter gave us a dismayed look. Without a word of greeting, he escorted us to a table. But the water glasses were filled with alacrity and the finished plates removed promptly. 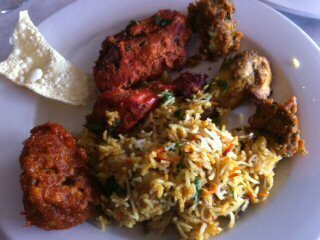 Given that much of the food turned out disappointing, we do not recommend Paradise Indian cuisine.